Improved capacity and efficiency with our new Uniport 5 CNC Portal machining centre. In December, we recognised the need for another CNC machine to keep up with our workload, increase capacity and improve efficiency. The Uniport 5 CNC portal milling machine designed by Unisign does just that and more. The Unisign vertical machining centre offers a large machining area with a minimum of floor space and enables fast and accurate machining due to its high milling and drilling capacities. 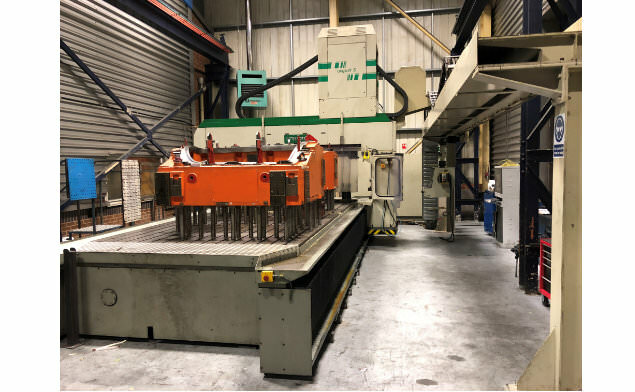 The featured twin bed, offers 7m (3.5m each) of working space, allowing us to machine on one side whilst having the ability to load and clamp on the other. This ultimately reduces downtime of the machine, keeping costs to a minimum. “It is great to be in the position where we are constantly needing to keep up with the demand and acquire more machines. It really is a testament to how well the business is doing at the moment. At Cube, we will continue to look out for the best machines to add value to our customers wherever we can. If you would like to work with us, please don’t hesitate to contact us today.